I have been eating this kale salad, or a variation of it, for weeks now. 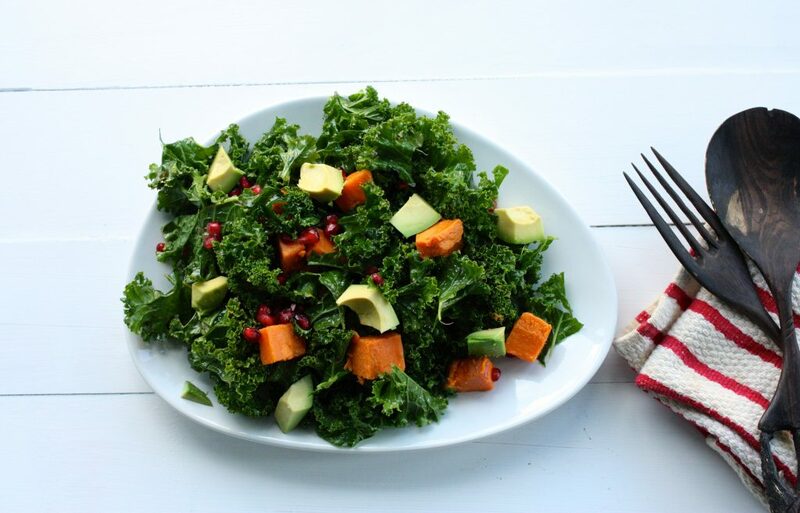 It’s colorful, seasonal, and features plenty of contrasting textures (crunchy pomegranate arils, creamy avocado, dense roasted sweet potato, and fresh kale). Once the potatoes are roasted, it’s easy to make, and the leftovers keep beautifully. I use sweet potatoes in the salad because they’re always abundant in my home. They store well, so I tend to purchase a lot at a time, and they can make a very easy dinner in a pinch: simply bake a sweet potato, stuff it with fixings of choice (I like coconut butter, coconut bacon, nutritional yeast, black beans, lentils, hemp seeds, toasted almonds, sauteed greens, marinated raw greens…the list goes on), and serve it with a generous salad, a hearty vegetable soup, or some legumes. If you’re in a rush, you can chop the potato and roast it (it’ll cook more quickly than it would if you bake it whole). That’s the method I use in this recipe, and it doesn’t take long, but you can also take care of the roasting a day in advance if you want this salad to come together quickly. 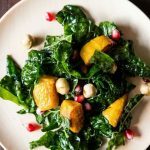 With all of that said, this salad would also be delightful with butternut squash, acorn squash, delicata squash, and, if you’re lucky enough to find some, kabocha. 1. Preheat your oven to 400 F. Toss the potato in the coconut oil, transfer to a baking sheet (or two) and roast potatoes until they're just golden and fork tender (22-25 minutes). Allow them to cool slightly. 2. 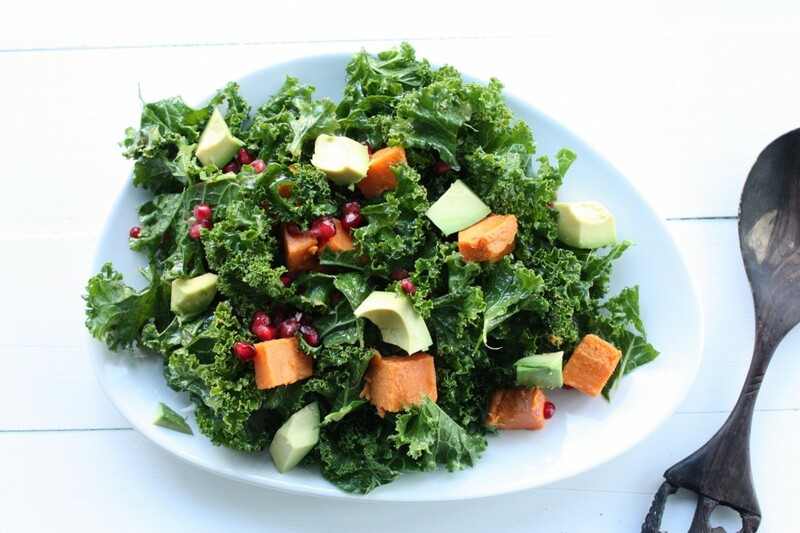 Place the kale into a large mixing bowl. Whisk the olive oil, vinegar, and mustard together and season to taste with salt and pepper. 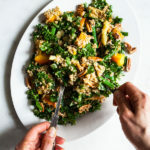 Toss the dressing over the kale and massage it thoroughly with your hands, till it's taking on a slightly wilted texture. Check the salad for seasoning, and feel free to add a little more oil or vinegar as needed. Add the potatoes and avocado, and toss gently to combine everything. 3. Divide salad onto four serving plates, and top each with a few tablespoons of pomegranate arils. Serve. Makes 2-4 servings. Recipe can be halved. Leftovers will keep in the fridge overnight. By the way, if the idea of opening a pomegranate for the seeds is giving you a headache, fear not! I felt that way, too, till I found this very handy video. Very helpful. Perhaps this salad will brighten up your plate this month, as temperatures drop. I hope it does. And I will see you all back here, with a luscious dessert recipe and another idea for edible giving in hand. Till soon! Yes indeed, it’s the only time of year that the poms are big enough to bother with, for the price! They’re perfect right now. Everyone BUY POMS. Also lol I made a salad right after thanksgiving with pom arils and the leftover vegan sweet potatoes my mom made for me. It was good, but it needed avocado. I learned a new word today! Aril! Go figure. Salad looks delish! Yum! I made one almost identical on Thanksgiving but without avocado( I’m allergic:(, and I’ve been craving kale since! 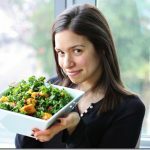 I have bags of it in the fridge and forgot how much I loved having it around for salads:) Greay recipe! Great post. The kale looks perfect! I shared a salad with pomegranate yesterday and use the same technique for seeding them- life-changing for sure! Never thought of sweet potato as a salad topper, but I LOVE it! I have made a salad similar to this before, so I already know it is going to be good! Avocado is a great addition to kale salad; sometimes I like to actually massage it into the kale (instead of using olive oil) with lemon and salt, which makes it so creamy and tender. Thanks for sharing! This looks yummy! 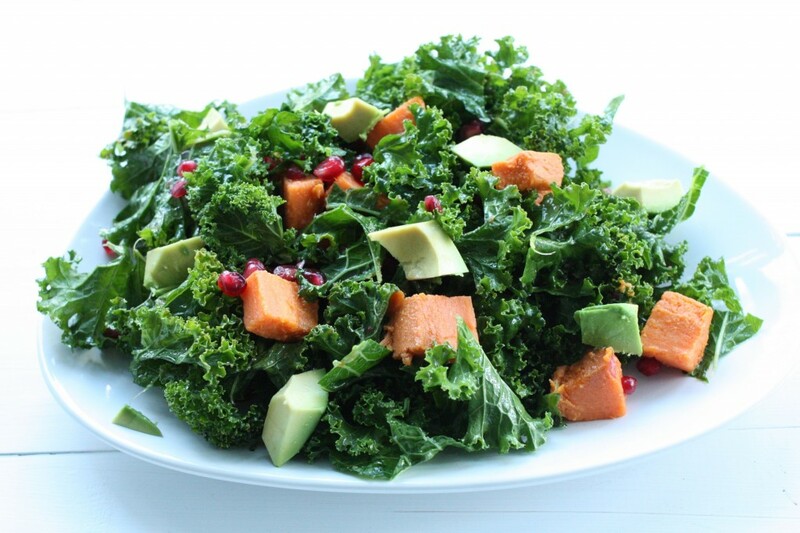 We have been eating kale salads with diced persimmon, which acts similar to a sweet potato, in that the sweetness counter-balances the bitterness of the kale, making it even more delicious. Thanks for sharing! 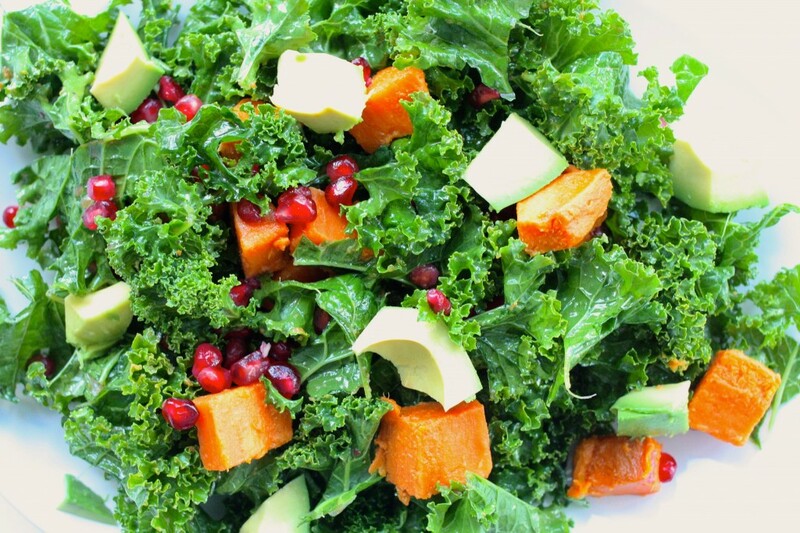 I love kale salads, but never thought to pair it with sweet potato. This is brilliant. I bet the sweetness of the potato is amazing with the kale. Looking forward to trying this. Kalpanjali has a experienced physiotherapists treatment center in Gurgaon provides manual therapy , customized orthotics and complete rehabilitations. Having this for dinner tonight. It looks great to the eyes so far.